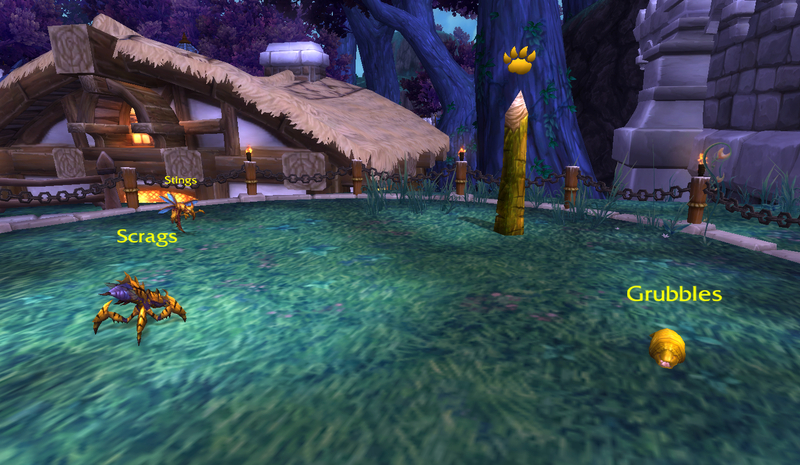 These Goren are getting to be more & more of a problem, seriously. 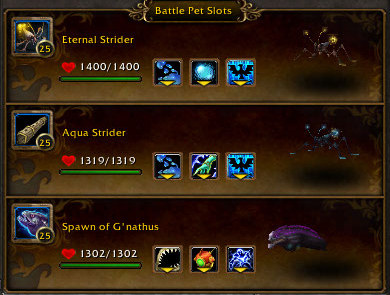 All 3 pets are relatively easy to get, though you’ll have a time of it leveling them to cap. 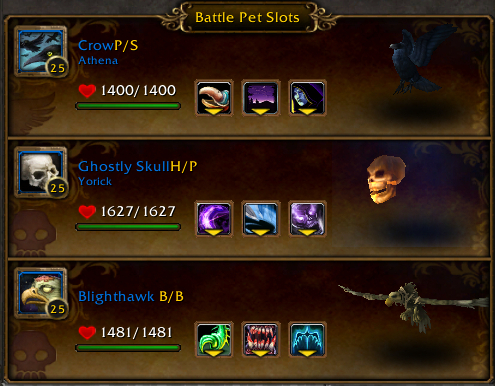 You can obviously swap the Gilnean Raven for that Crow or Dread Hatchling since we’re using the moves common to all 3. The important abilities here are Darkness, the Flying family, and Nocturnal Strike burst. You may be able to pull it out with the new Bone Serpent that’s a bit sketchy. The Ghostly Skull’s moves are unique, with lots of frontloaded Undead dps, and there aren’t a ton of options there either because we want to use that Spectral Strike move for synergy. Your best bet, if you can’t get one, is to just pick some really big hitting Undead DPSers & cross your fingers. The Blighthawk has a lot of longevity as the anchor with Consume Corpse and Lift-Off, plus undead DPS. Big, single-hitting Undead DPS is the key here, though you may want to pick something like the Fossilized Hatchling with a heal. So, as I said, the very first thing that happens here is the Rockbiter pretends he’s an elemental with Nature’s Ward. I’m not so much concerned with the Elemental of it all. Moreso, the fact that he now has 2 pretty big heals at the end of every round is concerning. Even though Rockbiter is ‘Elemental’ he still has his Humanoid heal. Cute. So the first thing I do is cast Call Darkness, then Nocturnal Strike. Rockbiter will burrow, but since you act first, you can always time your abilities properly. All Rockbiter’s offense is Beast, which is why having that Darkness on a Flying battle pet (which defends strongly against Beast attacks) is such a boon. After Rockbiter leaves the fight, Stonechewer enters. I can usually get off a few high DPS moves from my now-ailing Crow, but we really want to make sure that Darkness is up so we can use the Blind synergy for the Skull’s Spectral Strike. You may want to just attack the first few rounds though, because Stonechewer has a very hefty shield, but keep an eye on those cooldowns & durations. This is also why we chose Peck over Alpha Strike for the Crow. At 250 damage absorbed per hit, Alpha Strike can’t hit Stonechewer. Neither will most Undead-style DoTs like Siphon Life or Curse Of Doom. Neither will the reflexive damage of his hugely damaging Body Slam, which is super cute. Another reason I like the skull in this slot is that I can use Unholy Ascension just to ease the suffering of the rest of the match, but that’s not necessary. Acidtooth’s main ability to watch out for is Spiny Carapace, which deals 78 reflexive damage per hit dealt, with an increase to 234 per hit when it’s re-activated. He will reactivate it pretty frequently, and since Acidtooth’s 244 speed is faster than my Blighthawk’s paltry 230, Acidtooth effectively gets 2 turns with this. I counter this 2 ways. One is with the robust healing ability of Consume Corpse, and the other is using Lift-Off to just avoid attacking through one of those turns. I also Infected Claw, a single-hitting ability, so even when I do hit him I’m not taking too terribly much reflexive damage. Acidtooth also has a DoT with Acid Touch and the straightforward humanoid damaging Punch. 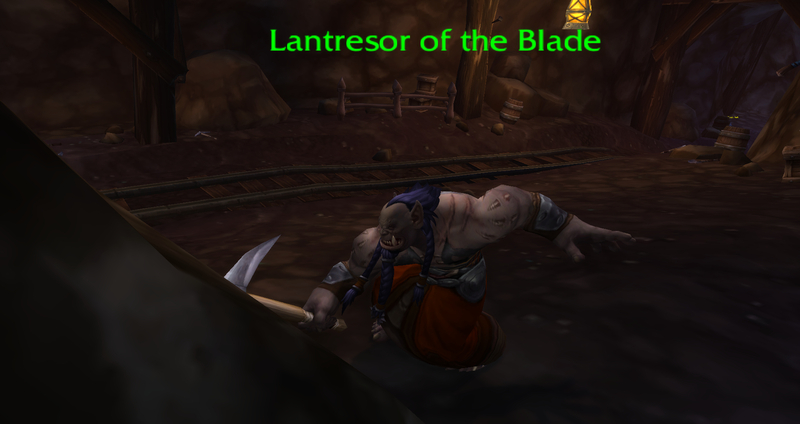 With luck, and time, you’ll be able to banish the goren back to your mines for Lantressor to deal with. This entry was posted in Uncategorized and tagged garrison, menagerie on February 2, 2015 by Liopleurodon. I suppose it was natural that someone so thoughtful and so giving would snap, eventually. They tried to upgrade him! What choice did he have?! His 2 bodyguards will ensure that nothing stops his philanthropic mission. 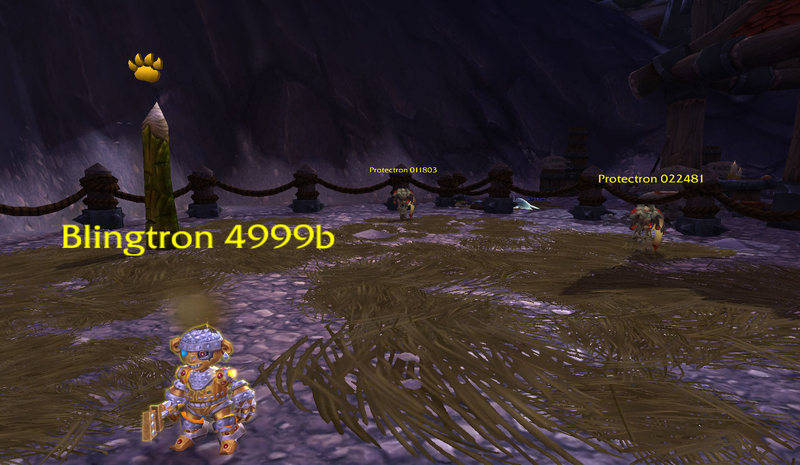 Why, it’s the Blingtron 4999b, Protectron 022481 & Protectron 011803 pet battle! This couldn’t possibly end in far-reaching apocalyptic destruction. The team starts with my Pandaren Water Spirit. This is backed up by the relatively easily tamed Electrified Razortooth (you’ll still have to do the very first Isle Of Thunder unlock scenario) and the Molten Corgi, which was automatically obtained for the very recent 10th anniversary but is now no longer obtainable. The weirdest, most irritating thing about this fight is Roboflauge, which for some reason makes all these pets take damage as though they were critters. Critters take less damage from elemental moves, while Mechanicals usually take extra damage, so this is a serious wrench in the works. 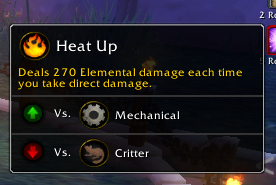 Since they still all deal Mechanical damage, this is doubly a problem, since Elementals still defend strongly against this, and Beasts still take additional damage from everything they’ll dish out. To build this team, I simply combed through my list of Elementals for some that deal Beast damage. 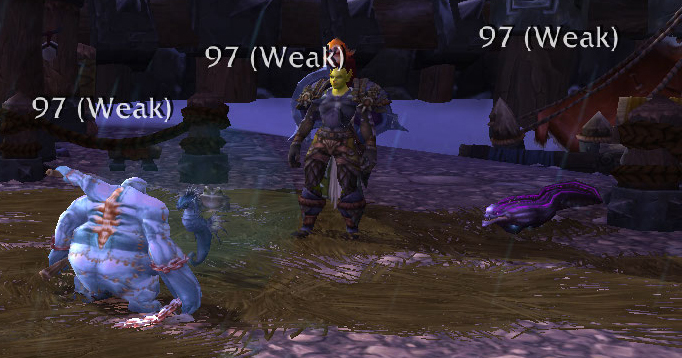 The Pet Journal Enhanced addon makes this sort of team building far, far easier, as you can use the enclosed ticky boxes to narrow down your selection to only elementals with beast abilities. If you don’t have very many of these, you can sub out for some elementals that deal off-family damage, like the Water Spirit with its Aquatic damage, but you don’t want to grab too many of those. The Sapphire Cub from Mists Of Pandaria Jewelcrafting is a good pick, and there are a couple Timeless Isle drops that’ll work well too. 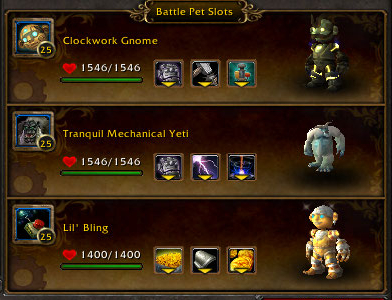 The Blingtron leg of this fight comes first. He hits somewhat hard with Club and Batter, and his AoE Armageddon does a bit of damage, but with an all-elemental team it’s not a huge deal. The one caveat to your selection process is that you need to select something that has either a full dodge or a good couple of heals. Both Protectrons have an identical moveset which includes Ion Cannon. The Molten Corgi’s Puppies Of The Flame or moves similar to it makes this extremely easy to dodge, but you do need to avoid these Ion Cannons if at all possible, because even with the family defenses of Dodge it will hit very, very hard. This is why Miss Gloria is in that anchor leg. She can all but solo the 2 protectrons. The real insult here is that, even with Roboflauge, these fakey fake critters still use their Mechanical resurrected turns. How rude is that? This entry was posted in Menagerie, strategy, Uncategorized and tagged menagerie, Warlords of Draenor on January 10, 2015 by Liopleurodon. It’s yet another menagerie fight! 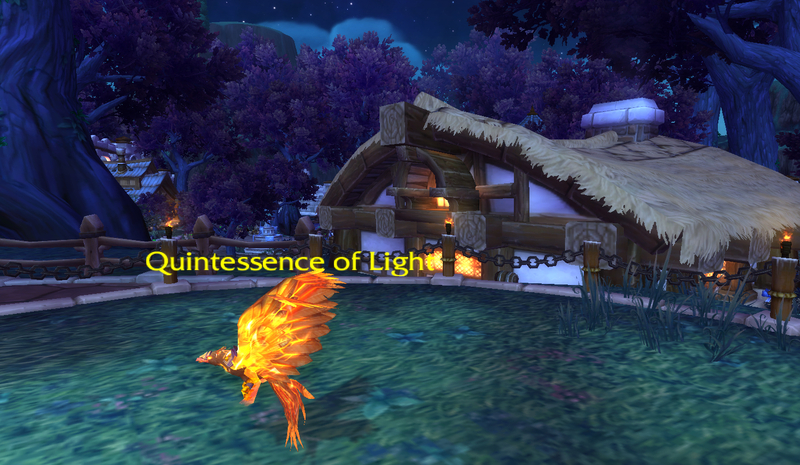 This time, for either Scrappin or Battle Pet Roundup, you’re going to face Quintessence Of Light. This is going to be a tough one. Quintessence is a moderator & site contributor over at Warcraft Pets, and also writes her own stand-alone pet blog at Perks And Peeves. She knows what’s what. So does this pet, but we’ve got the tools to get the job done. The Creepy Crate is honestly, oddly, primarily a stall. You can fill this role with most battle pets. Mechanicals are right out, as all Quintessence’s offense is Elemental. The thing I particularly like about the Crate is that it has a lot of DoTs to lend a hand, and that Curse Of Doom is definitely a plus. I’ve used a Fel Flame, the Macabre Marionette, a Wild Golden Hatchling, a Nether Faerie Dragon, and a couple others. Your choices are pretty vast, but I’ll leave this filler up to you. Unfortunately, the latitude there is made up for with a rather specific next couple of pets. 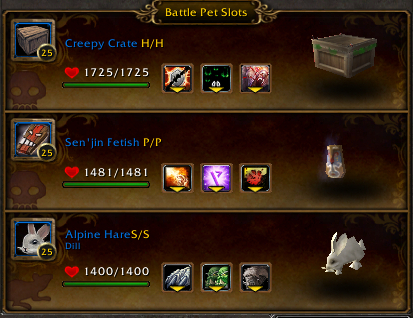 The Senjin Fetish can pretty much only be swapped with the Voodoo Figurine or Fetish Shaman, which are effectively the same pet. The Rabbit can be swapped for a handful of other critters, but this is one of a very few times I’m going to caution you on breed. Stampede or Swarm is crucial here, but your critter has to has over 315 speed. Like I said, the first pet just kinda stalls, up until the point Quintessence Of Light casts Heat Up. We need to have control over Heat Up to win this fight, because it’s a doozy. Heat Up deals 270 damage to Quintessence’s opponent every time they deal direct damage, and persists for 3 turns as a buff on her. “Direct damage” is an important distinction. DoTs don’t really count. But we need to know when it’s coming to time everything else. As soon as Quintessence casts Heat Up, swap on over to your Fetish. Cast your Wild Magic and Dragon Breath as needed. You’re slower than Quintessence, a Flying pet, so you should always use Rot on your ‘free’ undead Res turn. After that, it’s bunny madness! Stampede your fuzzy little heart out. Depending on prior RNG, Heat Up may come back up during that last turn of Stampede, which is why I go with the speedy rabbits. At that point, Quintessence will be below half health, so my rabbit will suddenly start going first. You don’t want to swap in your rabbit early to try & fudge using a slower rabbit, because Quintessence’s speed means you’re always a turn behind for swap purposes, so your Rabbit will get creamed before it does its job. This entry was posted in Menagerie, Uncategorized and tagged garrison, menagerie, Warlords of Draenor on December 17, 2014 by Liopleurodon. 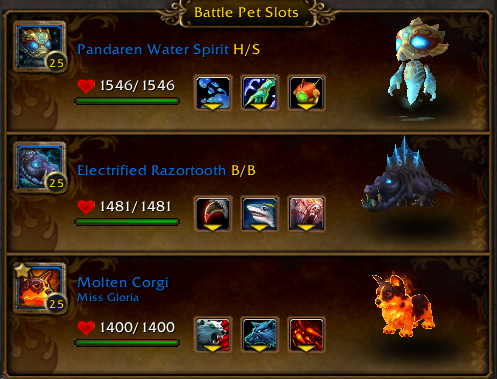 This trio of battle pets is another group you may face in your garrison’s Menagerie as a part of Battle Pet Roundup, Scrappin or Mastering the Menagerie. In place of the spider, most strong beast offenses will do, though there are a lot of high-level tamed spiders to choose from. Crabs do pretty well too, & same deal. The mechanical needs to have either very strong offense, or lots of heals & dodges. I tend to like the pets with big single-hitting abilities, like the tonk’s Lock-On, Ion Cannon, etc. In the last slot that magic damaging Dragonkin battle pet family is at it again. I like the handful with heals, just as extra insurance, but it’s not really necessary. The Nether Faerie Dragon in particular works out really well to level the playing field. The fight starts off relatively slow. Part of the reason there are so many available swaps is because Grubbles starts off with Sticky Goo, meaning that each pet’s abilities are relatively insular. There’s not a lot of synergy here, so just swap with wild abandon. Grubbles has the multi-hitting Flank as its main offense, which is why I like the Spider. Brittle Webbing means that each hit damages Grubbles too. Grubbles also has Adrenaline Rush, which he’ll use occasionally to get off an additional hit of Flank. This isn’t really an issue for my Spider, but if you’re making some swaps you may decide against, eg, using Pounce on a Cat here. Scrags combines a stun with Takedown. Because of Grubbles’ Sticky Goo, unless your previous pet has a dodge ability there’s no saving it by swapping out after the stun. Scrags also has Ravage so we have to watch out for heals. The best way to counter this is to simply destroy it. I like the Tonk here, because I can time my Lock-On to ensure I finish Scrags before it can use Ravage. As an added bonus, the Tonk has the Minefield ability, which will significantly damage Stings when it’s his turn to come out. I just keep using my Missile ability in the meantime. I’ve had really good luck with the Tranquil Mechanical Yeti with Ion Cannon, or the Clockwork Gnome with Build/Launch Rocket too. Alternately, the Darkmoon Zeppelin with the Decoy ability can clinch a win fairly handily. I can occasionally pull off a 2-pet carry with the Zeppelin, too. Stings can be very tricky, though so many of the teams in Draenor are Flying battle pets with Flying offense so you probably have the tools in your kit to prevail. Most Dragonkin battles pets with a Magic move or 2 can get the job done. I like the additional insurance of Life Exchange just in case Scrags manages to get off a Ravage & I have to finish the whole thing job with my 3rd pet, but it’s not really necessary. Stings uses Barbed Stinger, which means there is some degree of RNG involved, additionally so with Focus, so some heals may be in order if you’re getting smacked with the RNG stick. This entry was posted in Menagerie and tagged garrison, menagerie, strategy on December 11, 2014 by Liopleurodon. This team of 2 troublesome piggies has a few unique twists in the Menagerie ring, but as long as those piggies are Beasts, we’ve got the Mechanical cure. 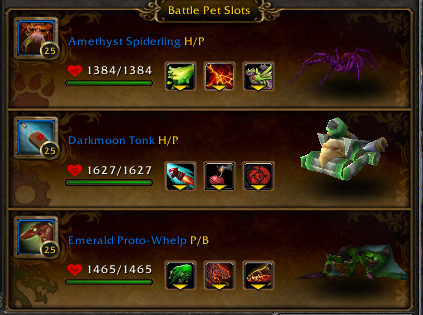 The only battle pet on the team which is crucial for this strat is Lil Bling. Lil Bling has unique moves and is the heavy lifter, so the other pets can be fudged a bit. If you don’t have one, other than urging you to visit your local Auction House because Lil Bling is really good, I’d suggest a flying pet with Flock like the Ancona Chicken as a possible stand-in. The Yeti is easily replaced by another pet with Call Lightning. A Wild Golden Hatchling or Skywisp Moth is far more obtainable. The Yeti does provide an extra bit of insurance with Ion Cannon, which is why that’s my top pick, but it’s pretty much a security blanket. 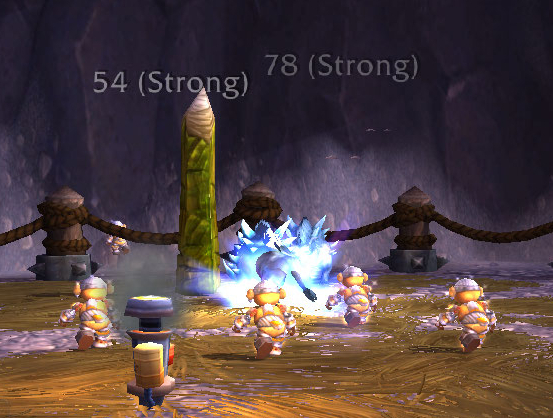 The Clockwork Gnome’s turret is quite unique, but a DoT, especially one placed on the front pet like Swarm Of Flies or even a weaker one like Death & Decay will work pretty well too. Rukus & Brutus have a self-heal at the end of every round, so when we kill them, we want to make sure there’s no getting back up. We’re going to do that with a combo play. We’ll send in the Clockwork Gnome to build a turret. Then the Yeti swaps in to cast Call Lightning. At this point Brutus has some really nasty tricks up his sleeve with Winter Spirit dealing lots of damage to both, because as Mechanicals they’re really vulnerable to it. He’ll also likely use Pig Out (a mechanic similar to Feed) after you use your Call Lightning, because hey, why not. Enter Lil Bling. Lil Bling is the key to this fight, because he has an extremely strong Mechanical DoT in Make It Rain, but moreso because of the havoc Inflation wreaks. 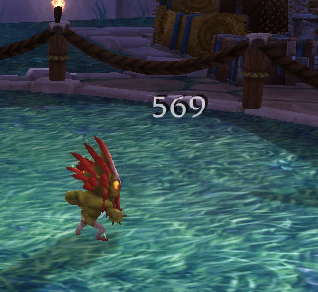 By itself it’s pretty strong against these beast battle pets. Paired with Call Lightning, the turret from the gnome and that Shattered Defenses (which multiplies all of the above) it will render these piggies into bacon in a handful of turns. 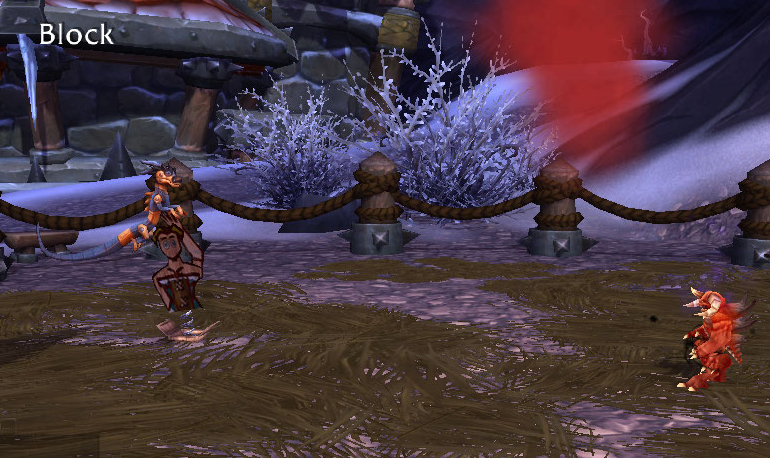 Rukus can make things a little tricky, by using Bloodfang to heal itself. Rukus will also use your own medicine against you by using Hunting Party, which has a similar mechanic to Inflation. This will kill Lil Bling pretty quickly for the same reasons. However, even though Lil Bling has passed on, his Shattered Defenses debuff will remain. One last Call Lightning should finish the job. Just FYI, I don’t think Serr’ah or Lio would be too pleased if you actually made Brutus & Rukus into bacon, so maybe don’t. Or at least go over near the fishing hut or whatever. This entry was posted in Menagerie and tagged menagerie, strategy, Warlords of Draenor on November 21, 2014 by Liopleurodon. This adorable little tamer hails all the way from Sanctuary, and has a full team of Diablo-themed pets for you to reap some souls from. 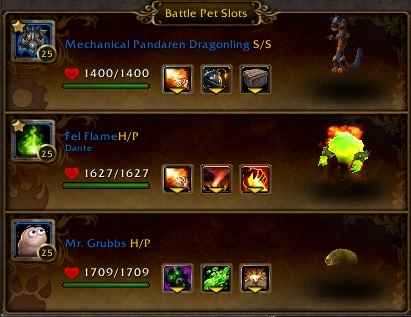 The Mechanical Pandaren Dragonling is the most obvious pick in the first slot, because Deebs is a Magic pet that deals Magic damage, and the Dragonling is a hard counter for both. I’d suggest a pet like the Emerald Proto-Whelp instead, with dragon abilities and lots of longevity instead, but it’s going to be an uphill climb. The Fel Flame provides a weather effect and a lot of burst DPS. Battle pets with Moonlight & Sunny Day should be down your list of effects to choose because the last 2 pets on the opposing team are Humanoid & their family heal will be buffed by this. Mr. Grubbs is on the team because of his reflexive heal and Burrow, which increases his longevity. Some other Undead pets will work, like the Restless Shadeling or the Fossilized Hatchling, but you need a pet with a lot of sustain to get the job done. Deebs, the Lord of Terror begins the fight. He’ll use the offense-dampening move Weakness, which is another part of why the Dragonling is such a stellar choice. It can just Decoy to avoid that debuff & get in some really good offense. Deebs also uses a move which roots your pet in place, making teams with excessive swapping less viable. The trickiest part of the fight is going up against Tyri. Tyri will use Darkness to Blind you & then use Surge Of Light to do big damage & stun. 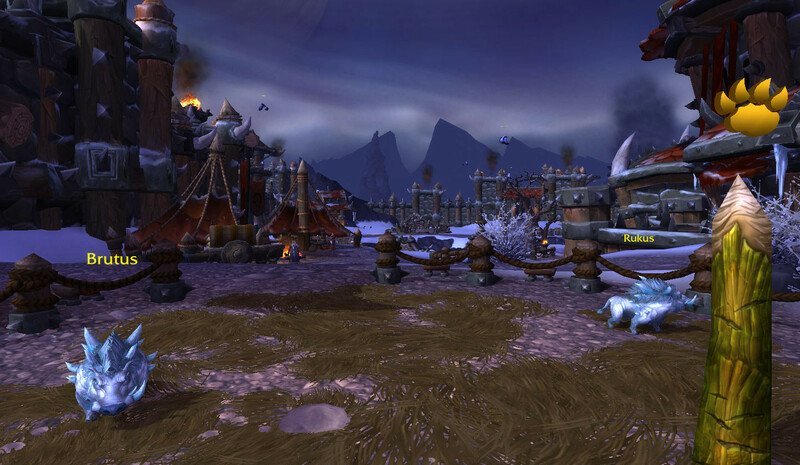 This is why we need that short-cooldown weather effect from that Fel Flame’s Scorched Earth. Surge of Light gets a huge buff from that Darkness, so it’s imperative we change the weather ASAP. The other benefit is that the Fel Flame will burst down Tyri before Tyri can destroy your back row with his other move, Omnislash, an AoE. The absolute best choice would probably be Frosty, the Wrath Of The Lich King CE battle pet, but that’s not exactly a fair suggestion. Any pet with a lot of burst damage and a weather effect will do. An alternate tactic, which I lack the timing to be terribly successful with, would be to use a pet which benefits from Darkness but is sturdy enough to withstand that stun turn. Puzzle the Treasure Goblin is less tricky than he is annoying, with a myriad of dodges, so you’re going to need a pet with a lot of self-healing & its own dodges to finish the fight. As an added issue, Puzzle will also cast Greedy, making your pet take additional damage, but also deal additional damage, which is why I really like the Grub pets with Consume, which scales with that additional damage dealt. You know, provided you can hit the slippery little jerk. Use your Burrow on those Dodge turns & you & your grub should come out on top. This entry was posted in Menagerie and tagged garrison, menagerie, Warlords of Draenor on November 14, 2014 by Liopleurodon. These flowers heard you painted some white roses red, and now they’re back… for revenge. This fight is quite tricky, as both King & Queen Floret use Righteous Inspiration. When they do, frequently, the result is a one-shot death. So, how do you counter that? A magic pet, of course. The Disgusting Oozeling in particular works well on this fight because when King & Queen swap, they take their DoTs with them. The other battle pets with this moveset work well of course, oozes and blobs and whatnot, as well as a few others. The Twilight Fiendling or Viscidus Globule are excellent picks for this strategy. We do want to stay away from Curse of Doom dots, because of how we’re using that 2nd pet (but to make up your own strategy, you may want to keep it in mind). The Kneebiter is absolutely indispensable here, but won’t play well with Curse of Doom. You may be able to make something work with a Summit Kid or something like that, but I don’t put a ton of stock in that because it doesn’t lend that Black Claw additive buff. 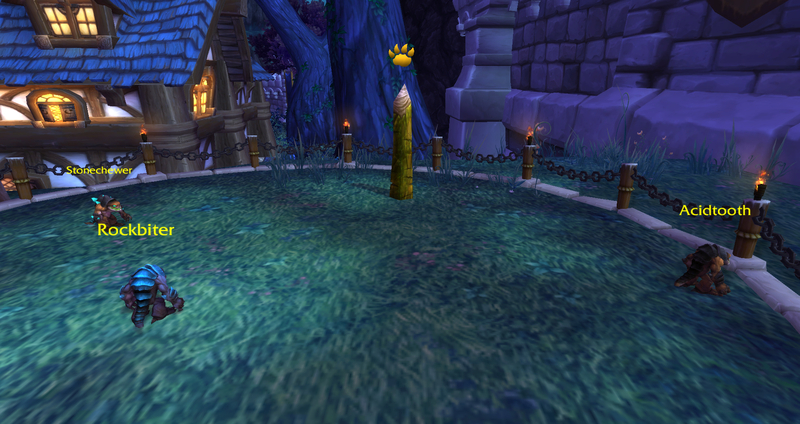 The final pet, the Shimmering Wyrmling, is a bit rare because it’s from the Argent Tournament. It does have a far less rare counterpart, the Mana Wyrmling, which is available off a vendor in Outland, but the Mana version starts off Uncommon. The main ability in play here is Deflection in addition to that Magic family ability. 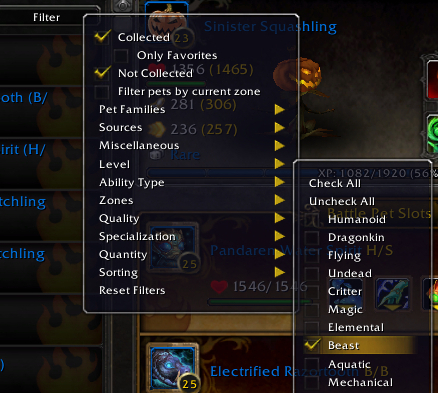 There really isn’t another good option, though if you’re desperate a Magic pet with Illusionary Barrier may work. The fight gets off to a very quick start, when the 2nd thing Queen Floret does is use that Righteous Inspiration swap. The first thing she does is use an unbuffed Fist Of The Forest for 800-900 damage which is really your only warning. Or, whatever 35% of your active Magic pet’s healthpool is. The first thing King Floret does as well is that 800 damage Fist Of The Forest, only now it’s buffed by Righteous Inspiration. 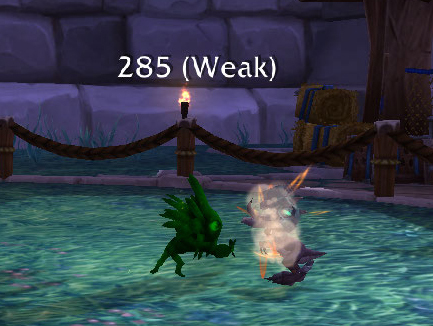 If you’re using a non-magic pet you must use some kind of Deflect or Dodge or whatever on this or your pet is absolutely going to One-Shot Battle Pet Heaven. 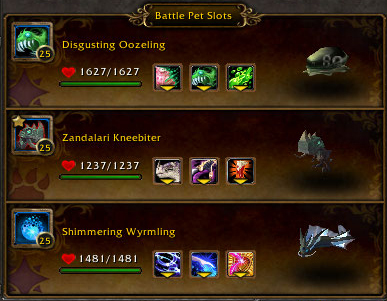 Your very first pet will live long enough for a couple of DoTs on both pets, at which point the Zandalari Kneebiter will come in. Oddly enough, now that the big-hitting Fist Of The Forest is on cooldown, your Kneebiter can roll through several turns of buffing with Black Claw and Hunting Party, since the rest of the King & Queen’s offense is relatively lackluster, and especially so against Beasts. Your Kneebiter will absolutely ruin King Floret, though unfortunately by now, Queen Floret’s Fist Of The Forest is back up. Your Kneebiter is on its way to Battle Pet Heaven. From here on out, your only recourse for avoiding that deadly Fist is going to be some kind of outright barrier, and that’s what the Deflection is for. Luckily, because of your pet’s Magic racial, even if you just avoid something you’ll be in good shape, but in general it’s a real good idea to use it the turn after you see Queen Floret use Righteous Inspiration. As long as you can avoid that Fist Of The Forest, you’ll be in good shape. If not, don’t worry. 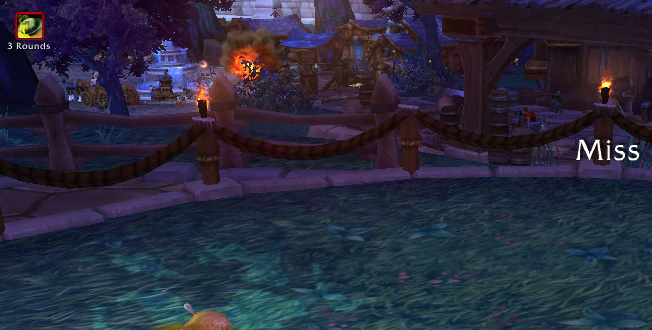 They have fetch balls and all the bandages you need in Battle Pet Heaven. This entry was posted in Menagerie, Uncategorized and tagged menagerie, strategy, Warlords of Draenor on November 11, 2014 by Liopleurodon. Carroteye, Mr. 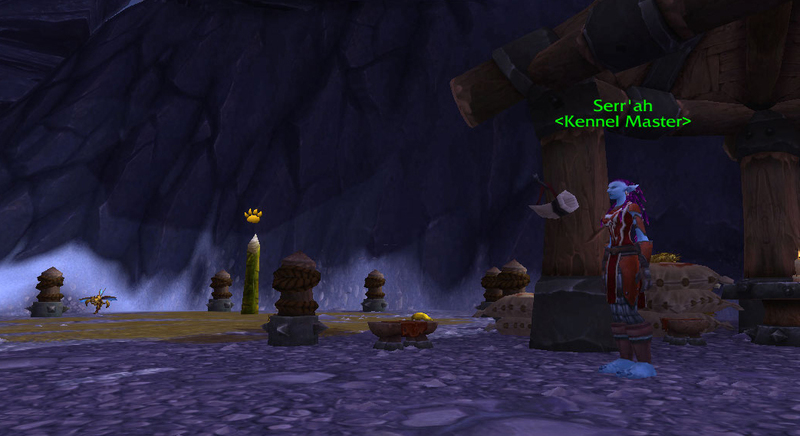 Terrible & Sloppus are a trio of extremely questionable foodstuffs apparently scrounged from the recesses of your Garrison’s larder by either a troll or a worgen. Either way, not a race exactly lauded for its excellent culinary prowess. Make sure you stock up on the Maalox before we start this one. The Eternal Strider’s main role here is to provide big Aquatic offense. The Pump move is an excellent one to keep on hand here. The Strider is easy to obtain at high levels though, so even from a standing start that one shouldn’t be too much of a stretch, though there are other options here too. The second pet I used was a frog, and again, that one is easy to grab from a standing start. A big attack and a bit of longevity is key for the second pet. Snails can work pretty well here too. 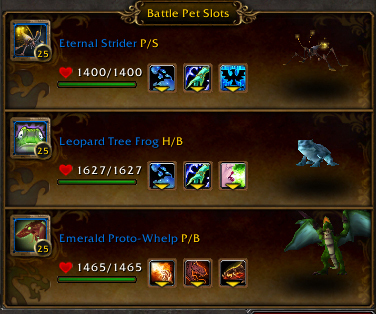 The third pet is my Emerald Proto-Whelp, which is a bit more difficult, but any dragonkin pet with the Onyxian Whelp moveset will work here too, among others. Strong dragon offense, a dodge and the additional heal finish off this strat. The weird thing about Mr. Terrible is that he will be unable to kill your pet. Well, sort of. He uses Weakening Blow as his only active offensive move. However, he also uses Spiked Skin. This means that you have to end things on your terms, which is why we can waste the day away charging up that final Pump for a finisher (though, full disclosure, I kinda screwed this up in the video, though I won anyway, so that’ll tell you what a great strat this is! eh? ehhhh?). Our pet will never be in danger of dying until we attack Mr. Terrible with that huge primed Pump. Carroteye uses a moveset very similar to Carrotus Maximus, which is why the frog I favored there is making another appearance. Carroteye uses Ironbark just the same, so Swarm of Flies is out. 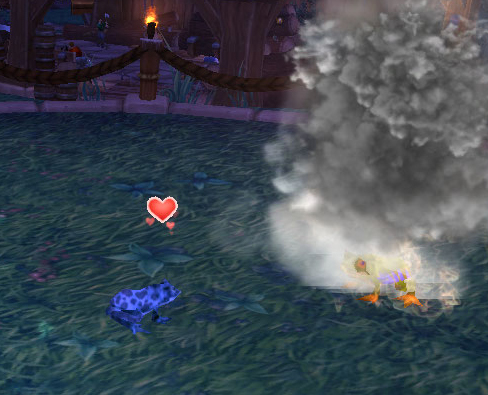 However, since this is a group fight the predominant move I’m going to use here is Water Jet, not Frog Kiss, because if that starts hitting you’re in trouble. I also like the frog as the mid-point pet, because although all its offense gets destroyed when the final, Magic battle pet comes into play, it can still Frog Kiss a few times in order to hopefully give you a couple free hits. Sloppus is the most infuriating part of this fight, because Stench means you start missing, and with the changes to Accuracy for 6.0, any time you miss it’s jarring and awful. It also makes the fight an RNG bonanza, which you know I totally enjoy as a strat writer. This, plus Chew, means that we need to have not only some longevity through heals, but also through some dodges. You likely won’t be able to use your avoidance move Chew every time, but with the heals that’s not really an issue. No, the real issue is how I’m going to get my blood pressure down after this complete hogwash travesty of a missfest. And now you know why I recommended the Maalox. This entry was posted in Menagerie, Uncategorized and tagged garrison, menagerie on November 5, 2014 by Liopleurodon. 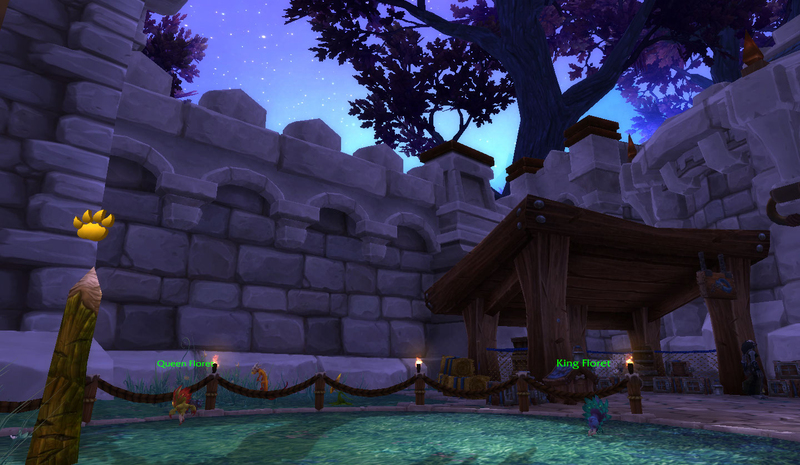 The Menagerie is located in your garrison, and is relatively central to your pet battling experience for the Warlords of Draenor expansion. I’ve written an overview of the Menagerie feature, as well as several posts outlining the strategies therein. To see which pet battle is being featured at the Menagerie today, click here for the pet calendar. 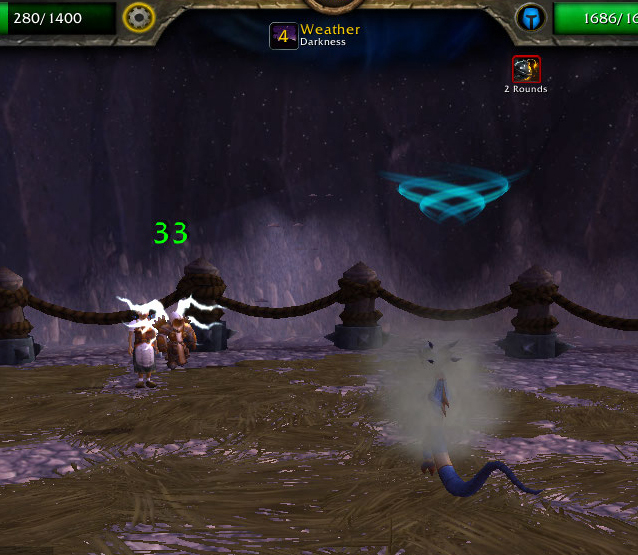 After you win 150 (down from 500 as of a hotfix on 12/3/2014) battles in Draenor & get the Draenor Pet Battler achievement, you can upgrade your Menagerie to level 3, which unlocks a different daily challenge. This challenge also requires you to defeat the opponent in your Menagerie’s ring, but will award an additional bag, the Big Bag Of Pet Suppies, which can contain a variety of new battle pets representative of some of the Menagerie fights. This entry was posted in Menagerie and tagged garrison, menagerie, strategy, Warlords of Draenor on October 21, 2014 by Liopleurodon. Alright, ALRIGHT. I confess! I was the one who helped some creepy old hermit in the backwoods of Duskwood, which is beyond clearly haunted, several years ago. 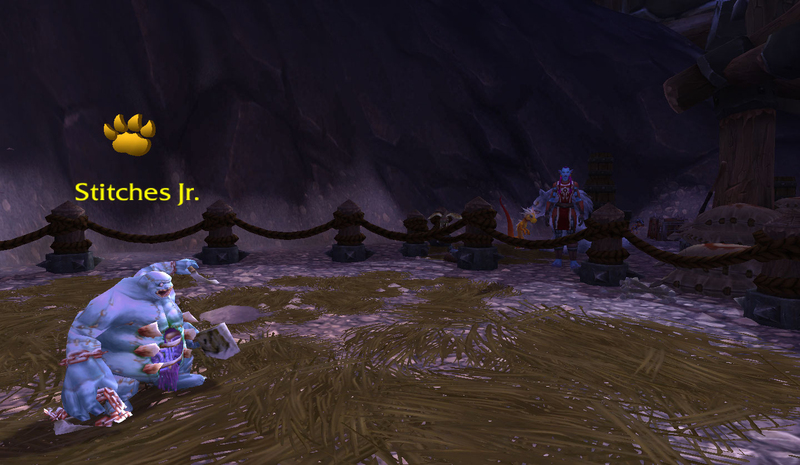 I was a bright-eyed young recruit, and the subsequent betrayal cost me, cost all of Stormwind, dearly. It continues to cost me dearly, apparently. 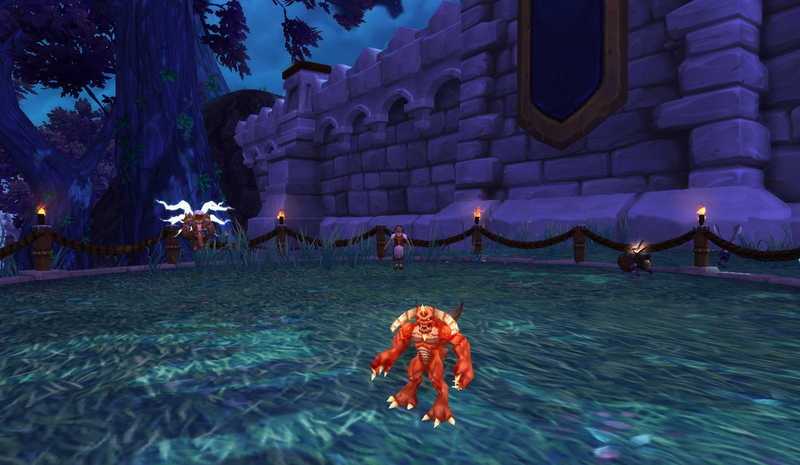 Stitches Jr is another of the many battle pets running amok (amok! amok!) 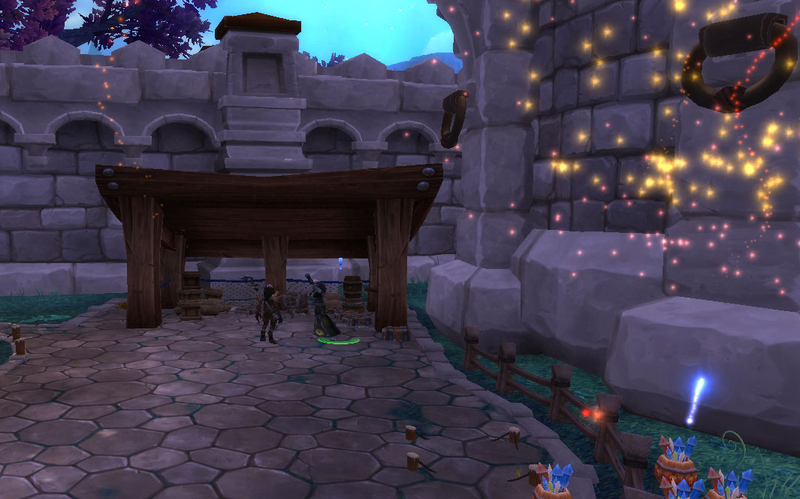 in your garrison’s Menagerie. He has a unique twist which you’ll find just scintillating, I’m sure. The team I used for the video was a little more exotic, using the Sea Pony instead of the Striders, so don’t panic if you’re here from the video. 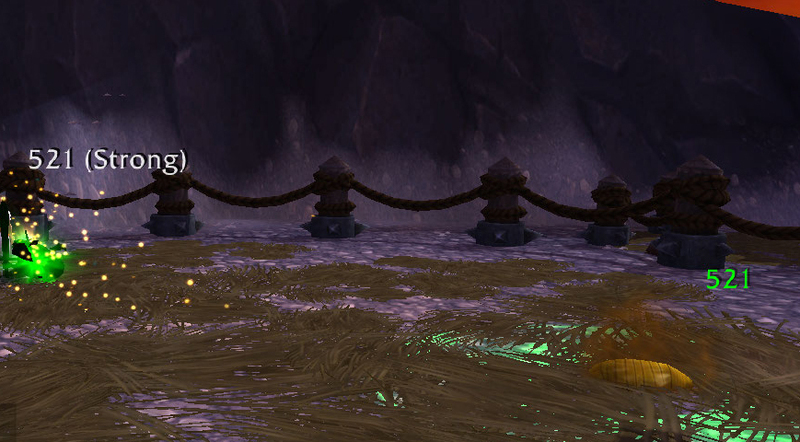 The Mud Jumper is another alternate pet which is a very common tame in new Nagrand, but again, mostly the same movesets as those old Striders. The thing we’re looking for here is Aquatic battle pets, to blunt the amount of damage Stitches Jr does. We’re definitely well-served using Pump. Cleansing Rain is also extremely useful in more ways than one. 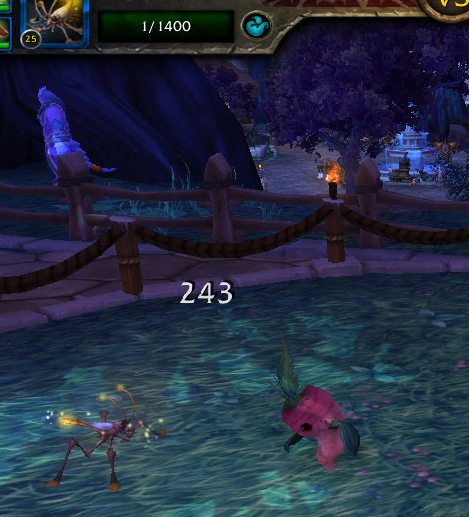 For the anchor pet, Spawn of G’nathus’s Swallow You Whole is an execute-style spammable move. All the pets with that move are relatively rare though, so instead you could opt for something like Howl + Surge Of Power from Chrominius. Just something to completely destroy that opposing pet in short order. So, why the emphasis on big damage? Iron Thread. Every attack has to count, and count big. To be clear, this means that if you deal 499 damage you’ll get a (Blocked) message, but if you do 501 damage you’ll deal the whole 501 damage with no additional absorb. Iron Thread is also why Cleansing Rain is so nice. The 25% increase to Aquatic attacks makes those big attacks just that much bigger. It’s also helpful, because it does a (relatively weak) AOE heal, and one of Stitches Jr’s offensive moves is Cleave, which splits the damage done among the pets still living. 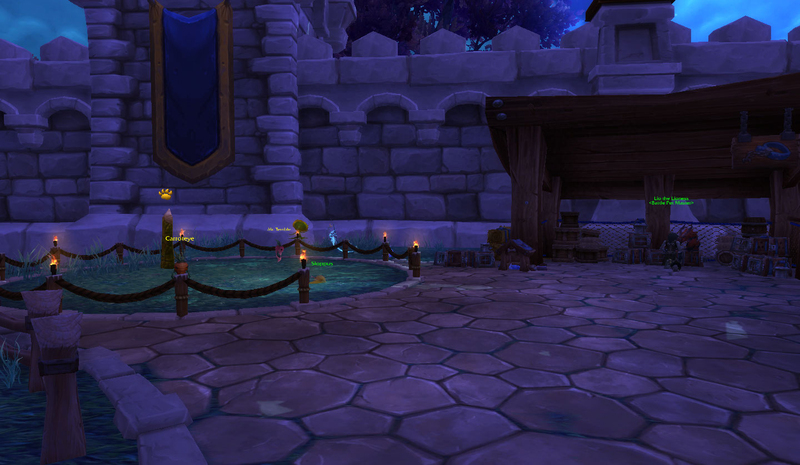 With all Aquatic pets, Cleave is kind of laughable, which is why that cleansing rain heal is a good idea. One last thing: watch out for that Undead res turn. This is the second reason I really like the Spawn of G’nathus as my anchor. I can just Dive to ride that out. 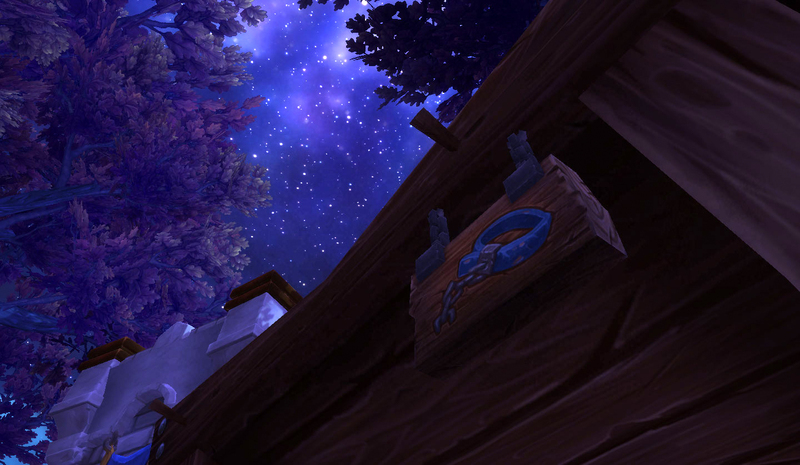 This entry was posted in Menagerie and tagged garrison, menagerie, Warlords of Draenor on October 7, 2014 by Liopleurodon.